I know I always say this, but I am so excited about today’s craft! Christmas kids crafts are always fun, but this one is definitely a new favorite for me. 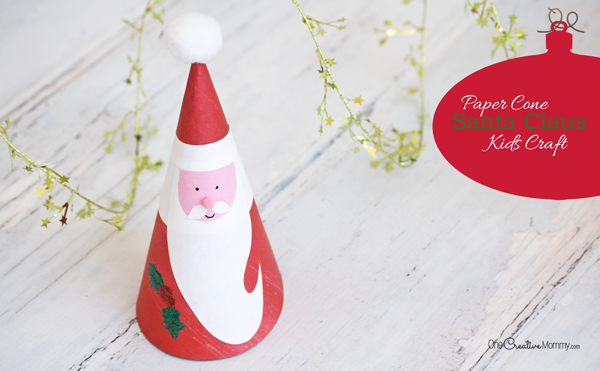 So, grab a mug of peppermint hot chocolate, put your feet up, and get ready to fall in love with a paper cone Santa Claus! A week until Thanksgiving, and then we’re in full-blown Christmas mode! Yikes! Why do I always feel behind when it comes to the holidays? One of these days, I’ll get ahead. At least I can help you get ahead with a great idea to keep the kids busy over Christmas break. Ready to get started? Here we go! Special thank you to Elmer’s glue for sponsoring this Christmas kids craft. I received materials and compensation for using their products to create a fun project for you. All opinions are my own. I only endorse products that I believe my readers will love! Find the largest circle you can that fits inside a 12 x 12″ piece of paper. The lid of a food storage bucket was perfect, but a large plate will work, too. 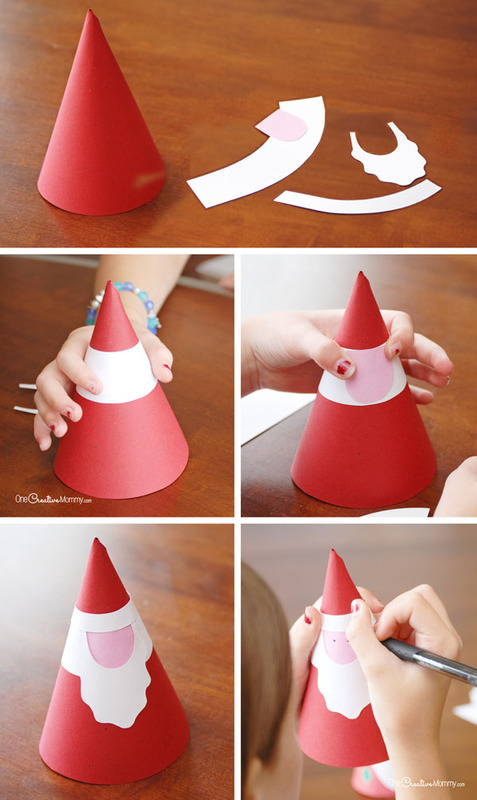 The bigger the circle (and the tighter you roll your cone), the taller your Santa will be. Gently fold your half circle in half, but don’t crease it. Just pinch the part where the straight side folds in half. This will mark the center of the top of your cone. Glue down the edge to complete your cone, and allow it to dry for a few minutes. Click the download image below to open the pdf printable in a new window. You can print from there, or save the file to your computer to print later. Add the paper pieces in this order: Hair/head (that’s the wide strip), pink face (cut the face shape out and trace it onto pink paper), beard, hat brim. Finish the face and decorate! Using a gel pen, add eyes and mouth. Now add a tiny red or pink pom pom for Santa’s nose. Add a mustache. Finally, grab the gel pens and decorate! Can you tell which Santas were made by kids and which one was made by an adult? It’s easy. The timid Santa with just a little bit of glitter was made by me. 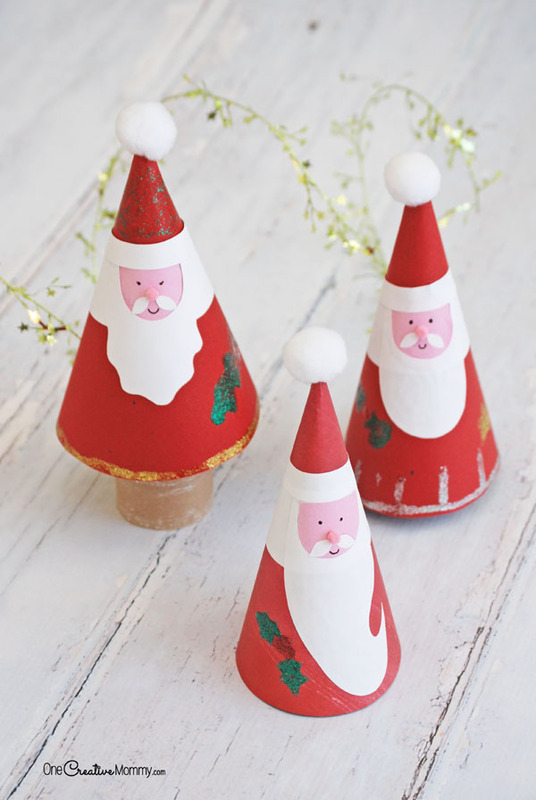 The fun Santas with glitter galore were created by kids. Kids definitely know how to rock the glitter glue! I love that they aren’t afraid to add their own style and personal touches to their Christmas crafts. What do you think? 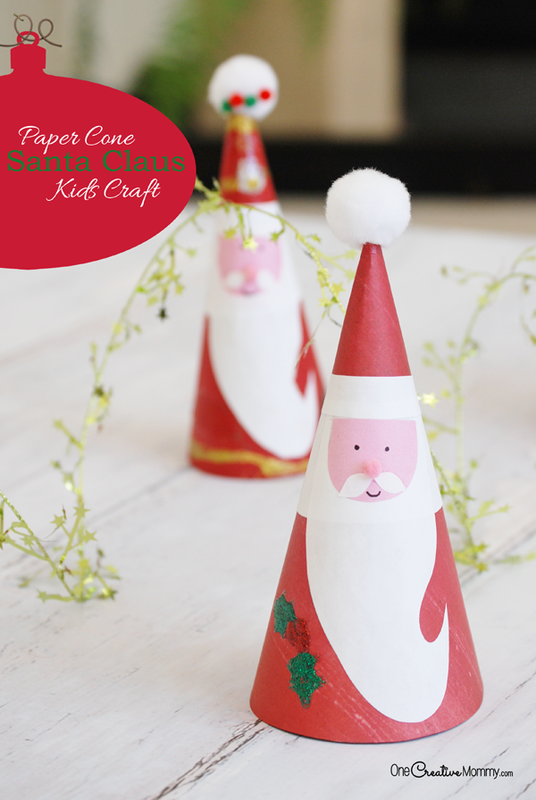 Does this Santa fit in the Christmas kids crafts category or the adults Christmas crafts category? I’m thinking both. Bring on the glitter glue. I want to make some more! 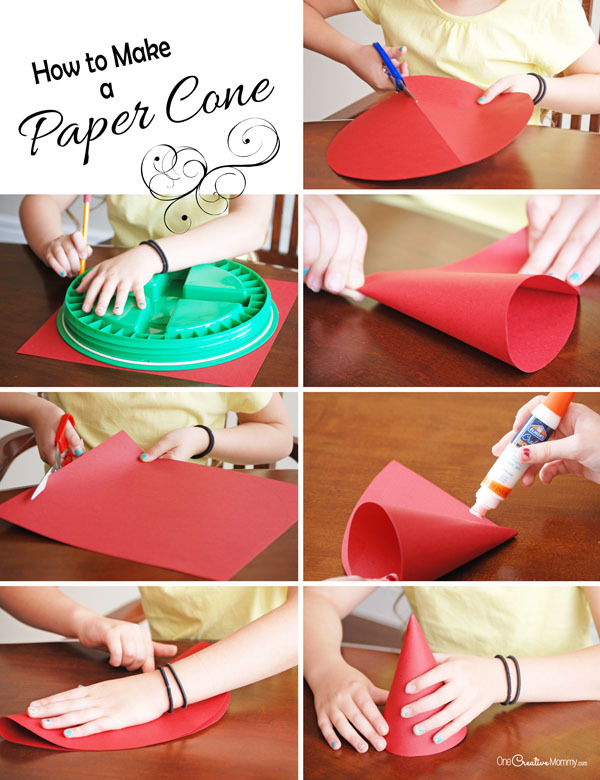 If you want to use this craft for your school Christmas party or the kids’ table at Christmas dinner, consider tracing and cutting the cones out ahead of time. There should be plenty of time for the rest of the craft. Thanks for stopping by today. 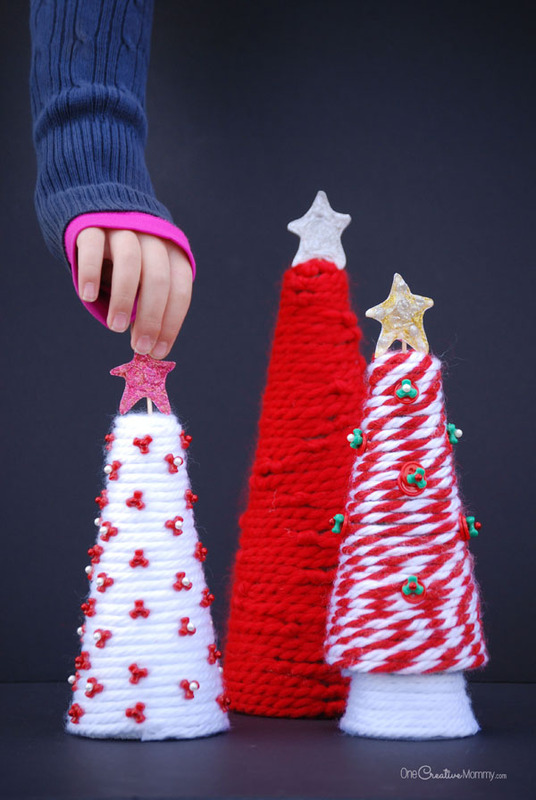 Check out more fun crafts for Christmas by clicking on the images below. Heidi, I just LOVE this! I’ve been thinking about the kids’ table for Christmas and these would be delightful. If you wanted to construct the main part and just have the kids apply accents, that would work for something to do before dinner. VERY cute and easy idea! Thank you! That is so creative and I would love to share this with my son’s first grade class. I’m the class mom and I would love to do this with his classmates. We’re jewish, but I love Christmas! Thanks, Nancy. I don’t know if you noticed in the comment above you, but Joyce suggested that you could make the cones ahead of time to make this quicker for a large group. You might not need to make the whole cone ahead, but you could definitely cut the shapes for the cones to save some time. I think there will still be plenty of time to make the cones. They only need a few minutes to dry. 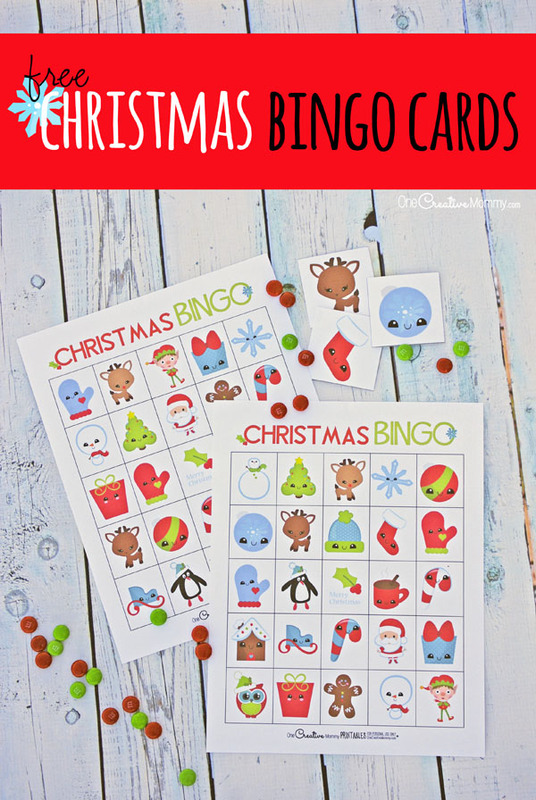 I’d better add this idea to my class Christmas party ideas post! Thanks for the reminder. It’s always good to get ahead for Christmas! Love this fun craft. 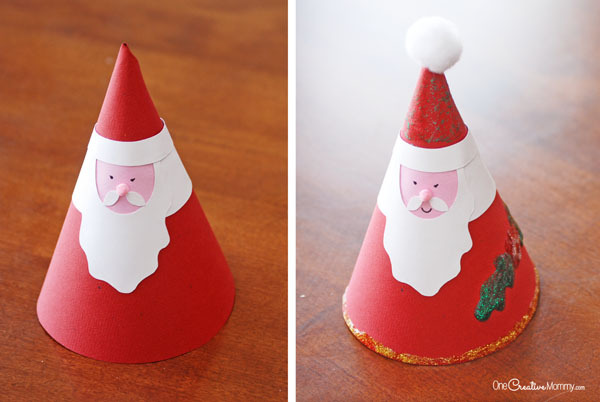 The Santas are so cute and I love how straight-forward they are to make with your printable. These make a wonderful Christmas decoration. Thanks, April. I never feel like I get ahead. My kids do get to do crafts a few weeks ahead of every holiday, though. At least they feel like they are ahead! My daughter loves to do crafts. She would really enjoy some of these!! I’ll have to show her! You should definitely show her, Leah. I don’t know if she’s a kid or an adult, but I think this craft is fun for both! I love these so much. They’re so easy for the kids to make, and they look like something right out of a store. Aw, thanks, Audrey! They were really fun to create and put together. I hope others enjoy them, too. These are adorable! 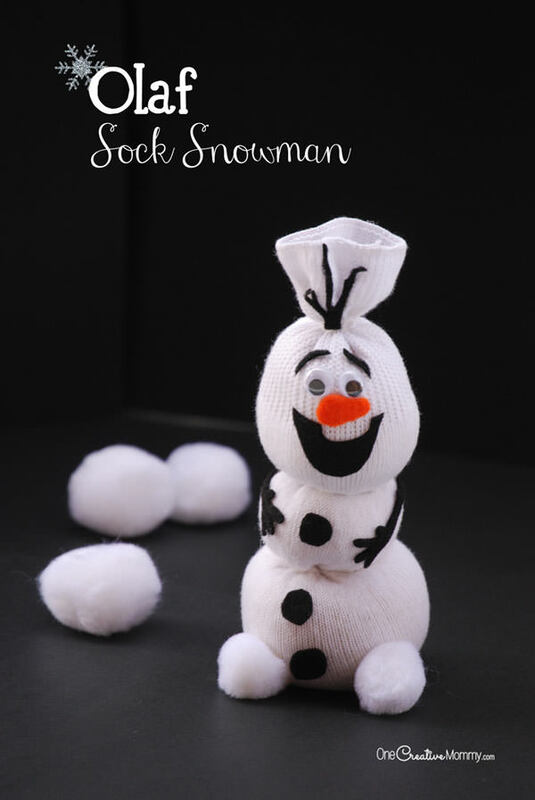 I am going to bookmark this for when the kids are on break during the holidays for a craft! Thanks, Jenn. I hope you and your kids have fun making them together. I LOVE these! How fun! 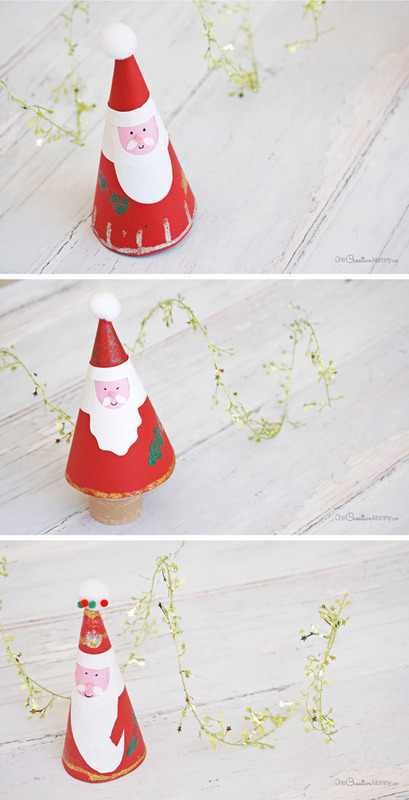 I’m always looking for fun holiday crafts and this is an easy and cute one. 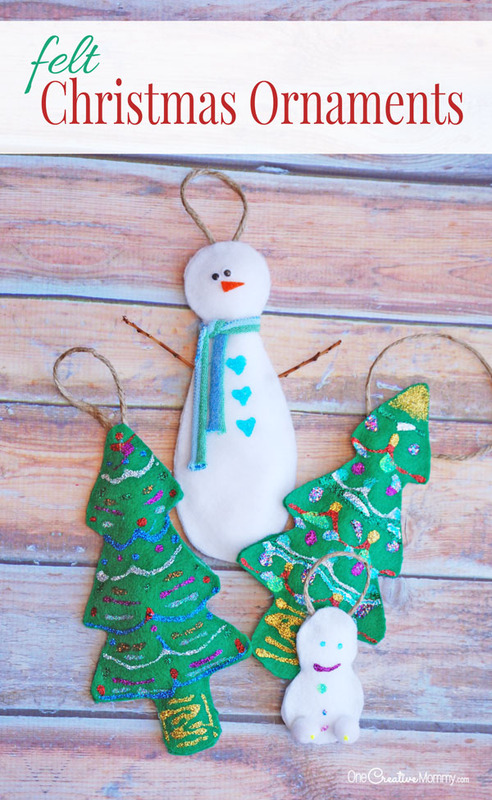 I also love the other holiday crafts you shared! These are so cute! My kids were just asking to do a Christmas craft, and I was wondering what to have them create. This is such a great idea, thank you for sharing! These are absolutely adorable.. I am going to try to gather up the supplies and see if we can make them! I know the kids will definitely enjoy it! Those Santas are really cute! It sounds like it’s simple enough that even I could do it. Thanks, Val. It’s a really simple craft. With the printables, I think just about anyone could do it! 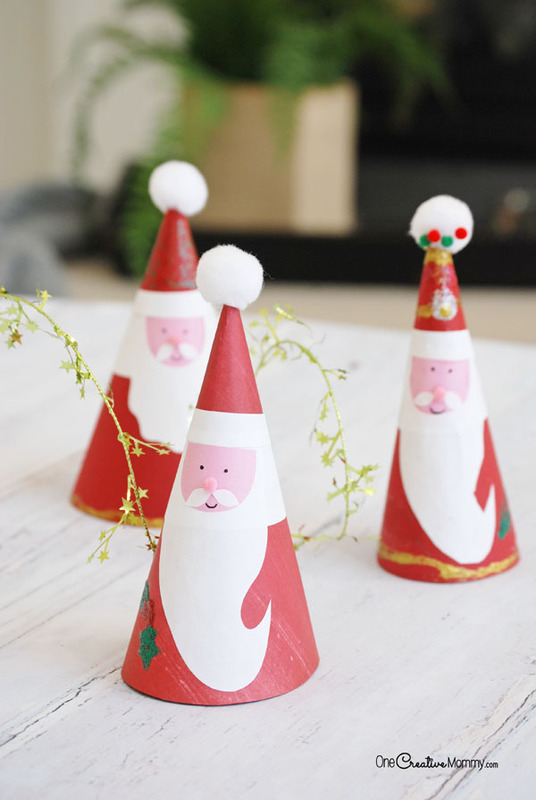 These Santa cones are super cute! Now if only I could cut and arrange the other paper pieces as well as you did. This is a very cute kit. It is well thought-out and has well spelled out directions. Thanks. It was a lot of fun to design and put together. Thanks, Calculadora! I think we’ll have a lot of these Santas decorating our house this year. Super cute! My daughter would love to make something like this. Visiting from Link Party Palooza. Oh help! I can’t get the white trim pieces to be the right size so they will stick to the red cone and not pop off–do you have any ideas? I used a 12″ paper, cut a large circle from it and cut that in half for my cone. Hi, Lisa. It’s hard to tell exactly what the problem is without seeing it, but here are a few ideas: If the white piece is too short, try rolling your cone tighter. I made that piece larger three times before making the final printable because it really does depend how wide you make your cone. 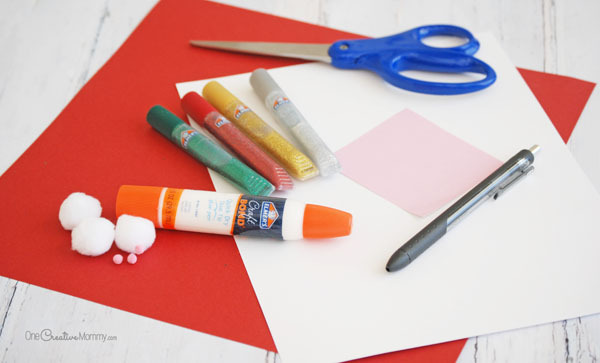 (If the glue is already dry, and you can’t make the cone more narrow, trace the trim piece on another piece of paper, but extend the sides to make the piece longer.) If the white piece is the right size, but it keeps popping off, try a stronger glue. I really like the one I suggested. I tried tape runner first, and my pieces popped off. I hope that helps! These are so cute! I love how simple they are and that you have kids assembling them. Thank you for the great idea. Wow.. this is really cute and simple to make.